For Owen Cross the only thing that matters more than family is farming. As the oldest Cross brother, the land is his legacy, and he'll do whatever it takes to make Cross Creek a success--including hiring local widow Cate McAllister to manage the bookkeeping tasks that are growing in his office like weeds. Cate's as pragmatic as she is pretty, and rattles his hard-fought composure at every turn. I would have laughed if someone had told me, after reading the first two books in this series, that stubborn, grouchy, all-work-and-no-play, Owen Cross would end up being my favorite Cross brother but that's exactly what's happened. There's so much more to this man than what we've glimpsed in the first two books and Cate McAllister is just the woman to bring it out. I loved these two together! Kincaid once again gifts readers with realistic, complex characters who bring both humor and heart...along with a fair amount of sizzle. Cate and Owen have both been impacted by losses in their lives. For Owen, the death of his mother strengthened his resolve to make family and the family farm his legacy. Work is all he knows. Cate's loss has left her determined to avoid the possibility of another marriage. Yet, the desire that flares between them won't be ignored. Kincaid guides Owen and Cate with a deft hand, keeping their relationship organic and moving it forward at a realistic pace. The banter and sexual tension between them is terrific and the unexpected emotion - especially on Owen's part - drew me in and kept me involved. I appreciated the gradual exposure of their personal histories, fears, dreams, and ambitions as their relationship deepened. Owen won my heart with his encouragement and support of Cate's dreams, something she had never before experienced, not to mention his skills in the kitchen. One of the sexiest things a man can do is cook for me and that's exactly what Owen does for Cate. I also love that Cate stress bakes as that's something I've done for years. It's so much fun to see ourselves reflected in the characters we're reading about. Kincaid keeps readers guessing as to the direction Owen and Cate's relationship will go until the very end then throws in a twist that I didn't see coming and about which I have mixed feelings. She entertains but also makes me think. I'm still thinking about this couple two weeks after finishing the book. While each book in this series can be read as a standalone, I'm glad I started at the beginning as the family's story evolves across the books and I feel like I know them better for having read the books in order. One of the things that I especially enjoy about the series is the Cross family dynamic that lays everything out for the reader to experience, both good and bad. There's a twist at the end of book two that introduced a new character who has a lot more page time in Crossing Promises, making me even more interested in the next book in the series. I can't wait to see how the Cross brothers deal with what's coming! Do you enjoy a story twist you aren't expecting? Have you read any of the books in Kimberly Kincaid's Cross Creek series? The first two books in the Cross Creek series, Crossing Hearts and Crossing the Line, are currently on sale in ebook format for $1.99 each. I read the first two books in this series on your recommendation, PJ, and really enjoyed them. I love unexpected twists in a story. 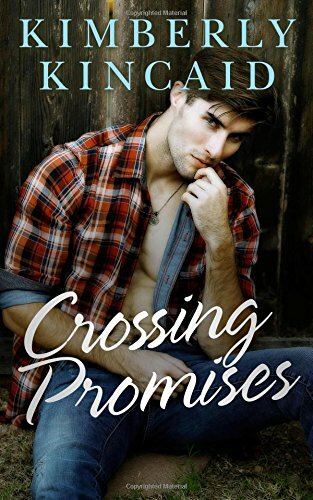 Crossing Promises is on my Kindle already. I look forward to reading it. Hope you enjoy this one too, Janga! I'm looking forward to hearing your thoughts about Marley's future once you've finished Crossing Promises. Now's a good time to give them a try at those terrific sale prices. Hope you enjoy them as much as I have! I haven't read any of the books in this series yet. I do love a book with an unexpected twist. Hope you give them a try, Pamela. I enjoy when an author who can keep me guessing and throw a curve in the story that I didn't see coming. Several of my favorite authors do that very well. This is a new series and author for me. I've fallen in love with this family. I'm glad we have (at least) one more book in the series to look forward to. I have read all of the books in this series and Station Seventeen and . . . We really need to talk next month in Madison about all these authors we both love. BTW, I had breakfast with Kimberly last year at Barbara Vey. Absolutely, Eileen! I'm looking forward to it!